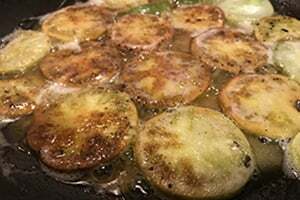 When they are golden brown on both sides, the fried green tomatoes are ready to come out of the pan and onto your plate. I am obsessed with two things in life. You probably guessed the first one: birds. But to anyone who knows me really well, their second answer would be fried green tomatoes. This was a dish that my mother would make, and she taught me how to cook it. Fried green tomatoes don’t really taste like a tomato. They have their own unique flavor, kind of like fried eggplant but not quite. Even my tomato-hating husband enjoys them. They were such a common item at vegetable stands where I grew up in Indiana, I was surprised to learn they were hard to find when I moved to Minnesota. Unless you had a garden or knew someone who did, I couldn’t find green tomatoes. You might find them at state fairs or in a fancy restaurant as an appetizer. Fair stands usually batter and deep-fry them, which kills the flavor of the tomato. Both restaurants and fairs will sometimes try to pass off a half-ripe, pink tomato as the real deal, which again, kills the flavor of the dish. You want a completely unripe, green tomato. Within moments we were having beer in their kitchen while they fried up some bacon and I was slicing their green tomatoes. They agreed it was a tasty dish, and they gave me permission to visit their garden during the summer whenever I needed some. I fought the urge to visit daily. I now live in an apartment building that has a sunroof where the owners allow us to keep container gardens. I can eat green tomatoes to my heart’s content. I have a large pot of herbs mostly for my pet rabbit and two huge self-watering planters for my tomatoes. The self-watering containers are the only way to go for tomatoes in pots. They demand a lot of water, about five liters in the morning and five liters in the evening. But the system is the only way to keep up with the fruit’s voracious need for water while keeping tomato-bottom rot at bay. I can see the roof from my unit, and every now and then I’ll catch someone scoping my plants, perhaps hoping to poach a red tomato. That’s rare since we eat most of the green ones when they’re large enough. The dish is simple: Take unripe green tomatoes and slice them up. 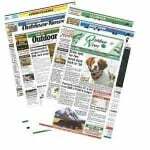 Some people like them to be a ¼-inch thick, though my husband prefers them thinly sliced. You dredge them in flour or cornmeal and fry them in bacon grease until golden brown on both sides. If I don’t have any bacon grease, olive oil works well. My mother served them with a sprinkle of white or malt vinegar. Some people like them with ranch dressing or just plain. I tend to eat them with a little bacon as a summer dinner. To go Full Hoosier, I’ll serve them with grits. Another fun way to eat them, especially in the fall if you have an over abundance after the first frost, is to make a green tomato pie. Here’s a recipe that I like to use from Taste of Home.